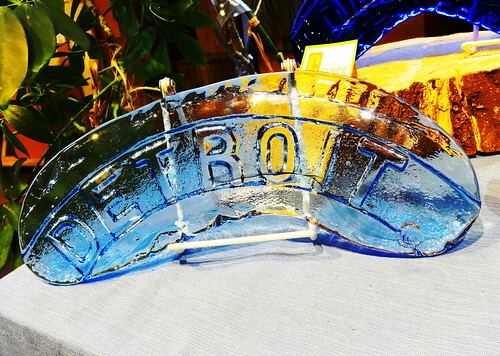 We’re in Dearborn for the Glass Academy’s Eggstravaganza; I’ve always wanted to attend one of their events. The 14,000 sq. ft. facility is nestled in an area of vintage tool and die buildings on the west side of Dearborn. 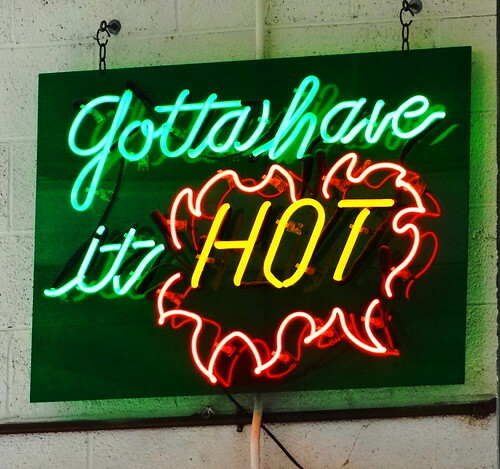 A large outdoor sign announces the gallery, there’s a cool Verner Panton design on one of the doors. The studio is open to the public Wednesday through Saturday functioning as a teaching facility, event space and design studio. 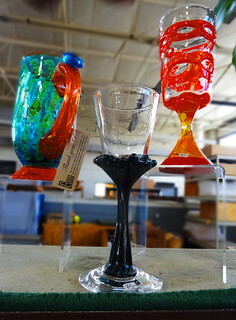 Staff members create sculptures for private, corporate and public clients. Today the gallery will be filled with chicks, eggs, bunnies and nests. A short hallway leads us into a large, open, industrial-feeling space. 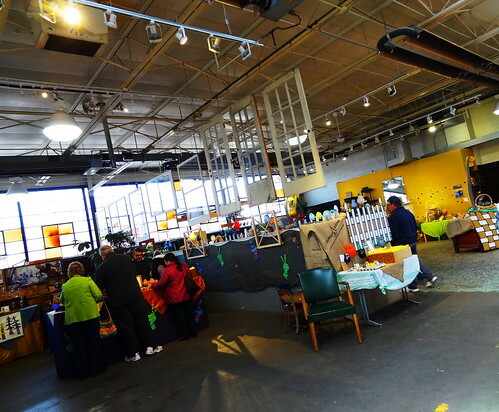 People are milling about, they go from table to table, egg cartons in hand trying to make their selections. 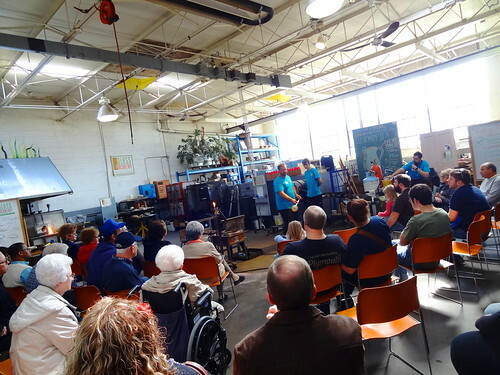 An orange glow emanates from the glass furnace, chairs are empty waiting for the demonstration to begin. Eggs are smooth or rippled, clear or frosted, colors are swirled, striped or mottled; I hold one in my hand and am surprised by the weight. 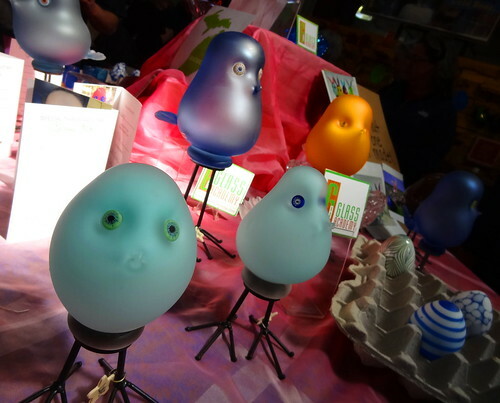 They take up residence in cardboard crates, delicate glass cups and nests. 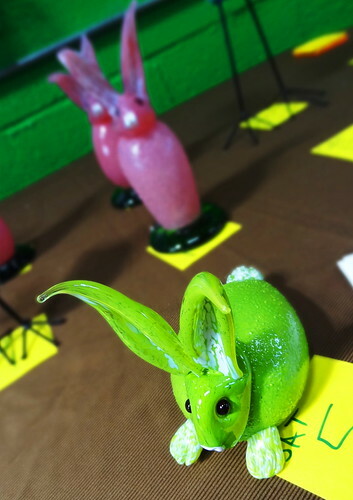 Long-eared bunnies wear spring colors; pink, lime green and yellow. 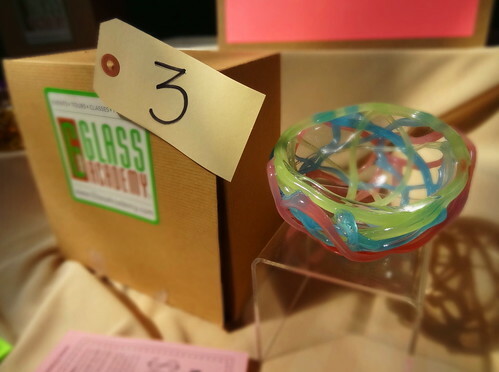 I’m fascinated by the glass nests; clear blue, crystal or pastel they remind me of spun sugar. Glassy chicks are today’s theme, they’re adorable! Blown in a rainbow of colors some are transparent, others are frosted, iridescent. Big and small they stand on metal legs; each is unique, as hard as I try, I cannot pick just one favorite. 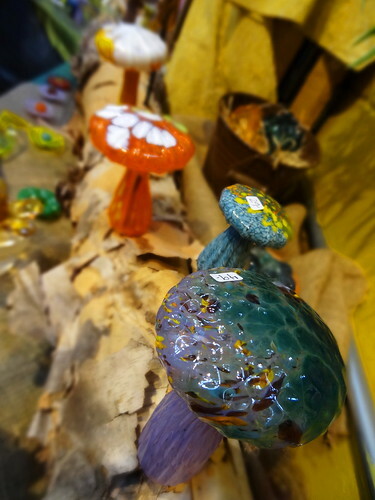 Off to the side a table displays nature-in-glass; percolla reeds, succulents, flowers and sporrela mushrooms–my favorite of the group. The Detroit table is next. 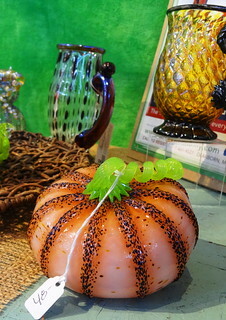 Another area exhibits stunning pumpkins and gourds, how do they get the stems to twist and turn like that? Like what you see? You’ll have to come for the Glass Pumpkin Fest in October. A wall is fitted with pegs, dozens of hanging mugs are for sale, want to make your own? 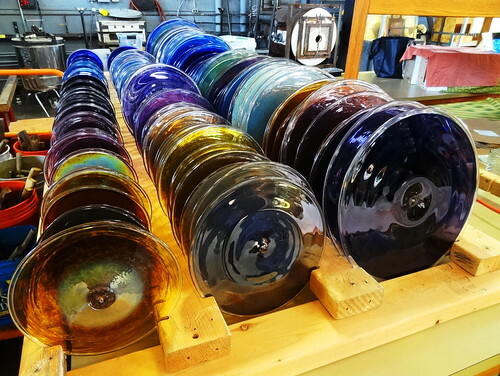 Sign up for the Hot Glass + Cold Beer class. The next table over is filled with Christmas items; trees, snowmen, candy canes, reindeer and snowflakes. 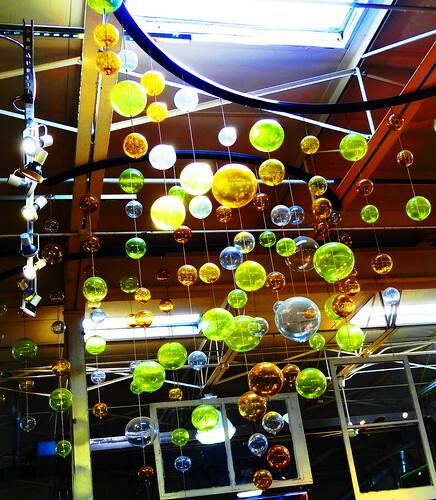 On my way to the glass blowing demonstration I stop and stare at dozens of hanging glass balls; gold, amber, clear and green spheres strung from the ceiling, cool! 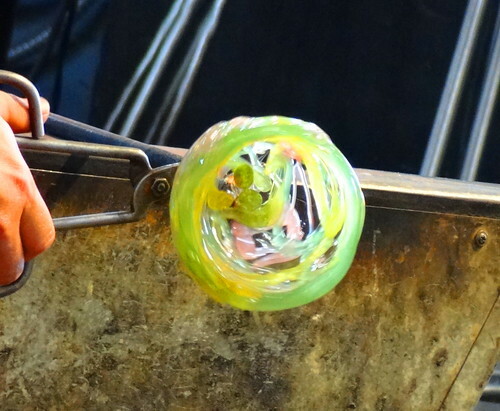 The chairs are now filled as spectators watch, listen and learn from master glassblowers. Kris and I stand and watch as a nest is created before our very eyes. It always makes me nervous when they break the glass off the metal pipe; this one is a beauty. 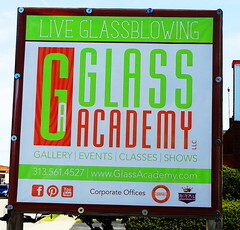 Glass Academy offers a variety of seasonal classes, coffee night, custom mug night and events. It’s a pretty amazing place, check it out for yourself. 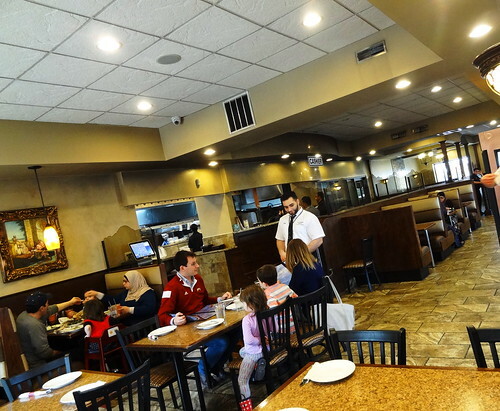 Today we’re having lunch at the ever-popular Al-Ameer on W. Warren; it’s one of the go-to places for Middle Eastern/Mediterranean food in Dearborn. Walking through the parking lot we pass cars from 4 different states. Inside we’re seated in a comfy booth, given water and menus, the latter is unnecessary. 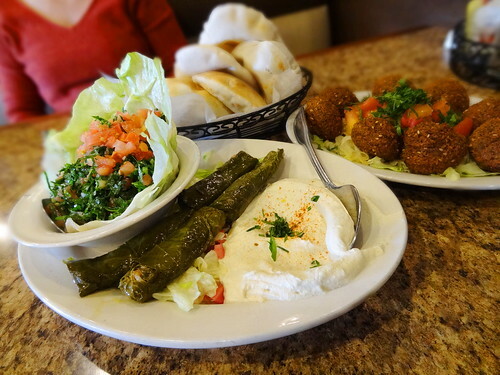 Our waiter takes our order and within minutes (yes, minutes) we are digging into vegetarian grape leaves, falafel, tabbouli, tahini, hommos and a basket of their to-die-for, straight-from-the-oven bread. It’s delicious, all of it, enough said. 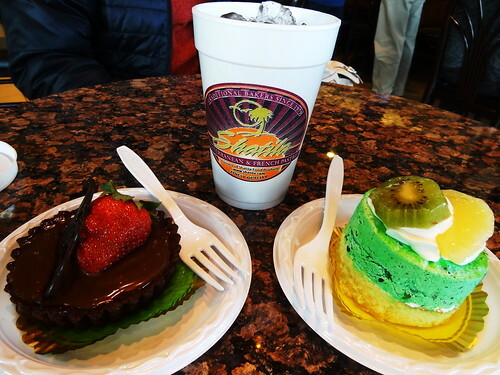 No visit to Dearborn is complete without stopping at Shatila for something sweet. The sun streams in from surrounding windows and reflects off the marble floor, Palm trees as high as the ceiling sprout from the perimeter, their trunks wrapped in tiny white lights. 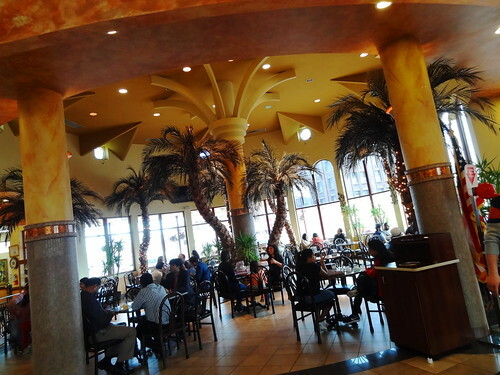 Mediterranean and French pastries are the specialty here, I go one way, Kris the other, meeting in the middle. The line moves quickly on this Sunday afternoon, before we know it we’re enjoying bites of rich chocolate tart and a pistachio torte. It almost feels like we’re sitting on a patio outdoors. We take our time, savoring the flavors, the surroundings and the day.